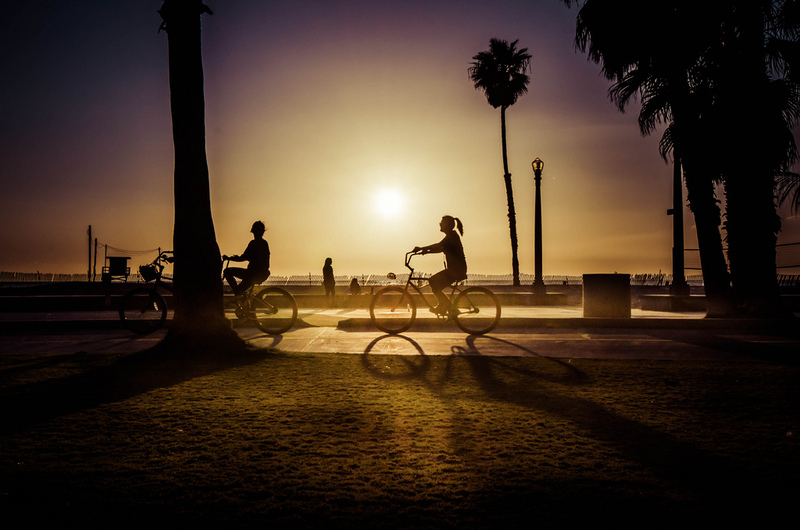 ART OF TRANSIT: A cyclist on the beach bike path in Santa Monica this past weekend. Photo by Steve Hymon. If approved, the law would be similar to one adopted in Idaho 30 years ago and would allow cyclists to roll through stop signs in the same way that motorists can proceed at ‘yield’ signs. A survey found that 90 percent of cyclists in Aspen are running stop signs anyway, a study found that Idaho’s law has improved safety and advocates for the law say cyclists will no longer have to slam on the brakes, which can lead to loss of control. They also say that it will lead to better interactions with motorists who are never sure what a cyclist may do at a stop sign. The two busy stations in downtown San Francisco would get a $900-million revamp in order to add platforms, staircases and elevators. The platforms would also have sliding glass doors that would open when trains arrive to prevent people from falling onto the tracks. The stations were designed in the late 1960s and BART’s ridership has grown to more than 393,000 average boardings on weekdays. 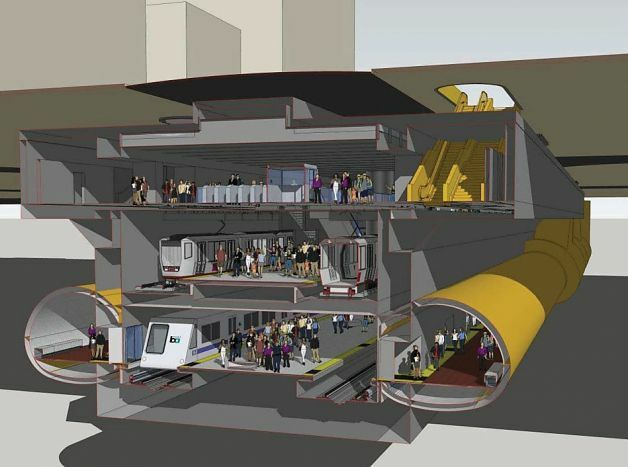 A rendering of BART’s proposed station revisions. Image: BART. Interesting story from the L.A. mayoral campaign that sort of involves transit. Greuel says Hollywood now has too much traffic and development, Garcetti says Hollywood’s turnaround is a success story. As reporter Dakota Smith notes, no skyscrapers have actually been built on Garcetti’s watch. She also writes that the dispute involves the city’s new zoning plan for Hollywood that would promote more development near housing. Some residents are suing over the plan, alleging it will allow too much development. Garcetti supports the plan, Greuel hasn’t taken a stance. Good issue. I live in Pasadena, where the safest place to ride are quiet residential streets that also have frequent stop signs and little cross traffic. In fact, the city encourages cyclists to use those streets, seemingly unaware that frequent stop signs are a deterrent for cyclists. So, either get rid of some of the stop signs in some directions or discuss such a law here! Your thoughts? No government agency should spend a dime of tax money building bike lanes or otherwise encourage bicyclists and motorists to mix in Los Angeles County. Motorists in L.A. are notoriously inconsiderate/oblivious of bicyclists. I say this as a person with 30 years’ experience bicycling the roads of West L.A., South Bay, Pasadena. I’ve been struck FROM BEHIND by cars twice, once in a quiet neighborhood, once on Wilshire Blvd at UCLA. A friend was recently struck on her bicycle in a pedestrian crosswalk on Westwood Blvd. A better use of tax money would be to regularly survey hospital emergency rooms for bicyclists and pay their medical bills. The problem I see with that law is that it contradicts what I see (perhaps wrongly) as the basis of vehicular cycling: that the bicycle acts like a motor vehicle. If I take the lane, wait my turn behind a bus, etc., I am setting up expectations in the motorists’ minds that I AM a car. Then suddenly I’m blowing through stop signs? Unless every single driver on the road knows about this law, they’re going to expect me to behave like a car. And since I can’t expect they know this, I’m going to have to ride just as defensively as I do now. I would support such a law if and only if accompanied by signs ON THE STREETS stating visually that ‘for cyclists, a stop sign = a yield sign if conditions are safe.’ Although I don’t know how that can be conveyed graphically, and be understandable instantaneously to people who don’t read English well. I am inclined to just leave things as they are, with cyclists tacitly allowed to break the ‘stop on stop sign’ law if AFTER EXAMINATION OF THE INTERSECTION it is safe to proceed through. I do not support cyclists automatically speeding through stop signs, which a good many do. RE: Garcetti vs. Greuel. Hollywood was disgusting for the last 30 years of the 20th century. Doesn’t anyone else remember how the LAPD had to close Hollywood Blvd. every weekend night in the 90’s because of the obnoxious cruising? The weekly onslaught of yellow “police line” tape because of drive-by shootings? I used to see a lot random violence in the streets – I remember seeing a pack of gangbangers beating a lone man on the steps of the Old Spaghetti Factory. If Greuel wants to credit (blame) Garcetti for a much-improved Hollywood, Garcetti should run with it. There’s a subway there now, so visitors have a choice as to whether or not to drive. Likewise, people who live in apartments or condos there have a choice as to whether or not to own a car.